RaceNation is the site I’ve been using for the past month. Like many other sites developed for and by athletes it is part community, part networking, part training log, and it is still in a Beta stage with open-minded developers welcoming feedback. Registering for the site was a piece of cake and like many other social networking sites, I was able to create a profile on the site that made me part of the community. I need to qualify this review by making it clear that I registered on RaceNation with the sole purpose of testing out the site’s training log feature and therefore did not take advantage of the site’s multiple networking and content (blogs, photo upload,groups, race calendar) features. 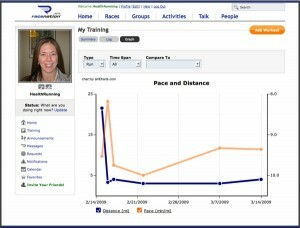 I started using the training log feature on my RaceNation profile two weeks before my first marathon when I was not only tapering down but also cross-training to reduce the pain in my IT band. What was instantly obvious to me about this log is that it is truly designed for training rather than tracking casual work-outs. The focus of the site is for runners, bikers, and swimmers and the log is centered around these three main sports. Adding a work-out is extremely easy and is done by clicking a main button on an individual’s home page. First, you name the work-out which I think would be hugely beneficial during longer training sessions. I can easily see myself naming my RaceNation work-outs the same names I have given routes in MapMyRun in order to be consistent with my training plans. You then select the sport (run, cycle, swim, or other) and enter the distance and time. If you select “other,” pilates or lifting weights, for example, the distance fields disappear and you can only enter time. This is fine for pilates but some of my “other” work-outs include the elliptical machine, speed walking, or dog walking during my recovery days and for these I would still like to be able to enter the distance. The sport, distance, and time are the data that are then used to create graphs of your training progress. You also enter the work-out type (distance, tempo, sprint, recovery, etc) , terrain (pavement, trail, treadmill, stationary bike, pool, etc), and how you felt. There is also a “Notes” section with room for 256 characters worth of reflection on the work-out. The options under “work-out type” are what, in my opinion, define this as a true trainer’s training log. The options also made me very aware that I am a beginner level trainer as I don’t know what all the options mean nor would I know if I had done some of them unintentionally. The run options are: Base, Pace, Distance, Tempo, Fartleks, Hills, Fast, Sprints, Easy/Recovery, and Walk/Hike. I’m not sure I understand the difference between Base and Pace nor do I totally understand the difference between Fast and Sprints. I know I’ve read about Fartleks before but I don’t always remember what it means. Though the intention (I believe) of community websites is for them to be populated by user-generated content, I think there is a huge opportunity here for RaceNation to provide a bit more value to the members as well as create searchable content on their site. Granted, it is free to join so beggars can’t be choosers, but if there was even a glossary of terms for these various “work-out type” options I would welcome the opportunity to learn a little more about training in the place I am tracking my progress. Selecting the “terrain” was always pretty simple and seemed to match up with whatever work-out I’d entered and I think it’s nice to be able to select how you felt after each work-out. I only felt limited by the options (great, good, blah, exhausted, injured) a couple times but the “Notes” section allowed me to be more specific about the work-out. I also think this could be easily remedied by adding “other” to the “how you felt” options list. The Log screen shows all details and notes for work-outs entered. 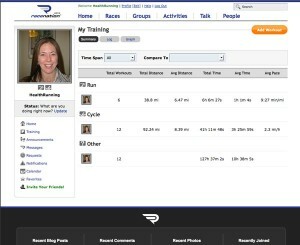 Once you start to accumulate some training data in your profile the site’s log features become more valuable. 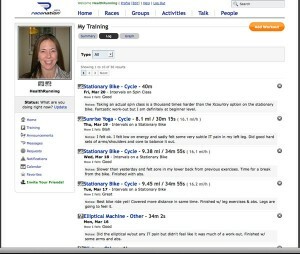 The training page of a profile has a Summary, Log, and Graph of the training work-outs entered. You can look at any of the training options with data from the past week, the past month, or all data entered. The Summary page is just what it sounds like; it’s a short list of just the number of work-out types entered and the totals and averages for distance and time in that work-out category. If I were training for a triathlon, this would be the ideal way to quickly see what sport I have either been focusing on or slacking on because I’d instantly see how many swimming, cycling, and running work-outs I’d entered. Hopefully this will come in handy for my first triathlon this summer! I’m a big fan of the Log page because you see in one long list all the information, including notes you’ve entered. I am a reader so I enjoy being able to scan my notes from recent work-outs to evaluate my progress. The Graph page is yet another way to evaluate progress though it’s strictly based on distance and time for a selected sport in a selected timeframe. Had I taken advantage of the networking component of RaceNation and added friends to my profile, I think it would be fun to use the “compare” feature of the Graph which plots your progress against that of your friends. For training groups and competitive athletes, I imagine this would be a good source of motivation so long as you recognize the various factors that will inevitably make one athlete appear “better” than another on the graph. This is a Graph screen of all Runs I entered which taper down significantly post-marathon. I wish I had come up with some sort of clever rating system (and perhaps I will by the time the next review is written) for the training logs I plan to review, but given that this is my personal, totally subjective opinion, I’ll just “rate” the various components based on my own experience. Overall, I like the RaceNation training log. I do think it caters to the competitive and perhaps more advanced athlete and I wish it had more options for detailing work-outs not related to the main triathlon sports. However, when it comes to logging running, cycling, and swimming, I think they’ve done a great job of offering athletes a helpful training tool. I also believe that if you register on RaceNation and participates as an active member of the online community rather than just using the training log, the whole site will provide value, education, and motivation for an athlete at any level of training. Next up, I’m going to test out the training log in my Runner’s World profile followed by Running Ahead so I can compare experiences of logs using the same back-end technology.